The dollar against the Japanese yen (USD/JPY) strengthened during yesterday’s session. As can be seen from the chart below, Friday’s closing was over 110.00, which has been a key resistance since the beginning of this year and has previously also acted as a support. 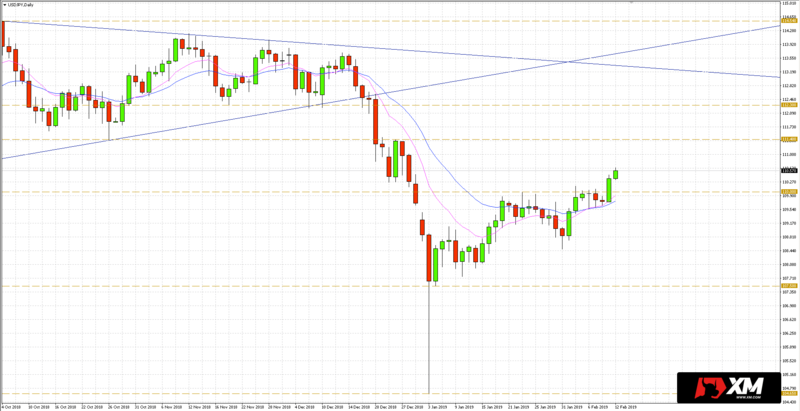 Yesterday’s breakout, therefore, paves the way for further increases. The closest key resistance in this scenario is visible at 111.40. It was from this level that the last downward impulse began, culminating in a flash crash low at 104.65. Traders can now focus on searching for buying opportunities. One of the strategies is to wait for the withdrawal to support, which is now within 110.00 (earlier resistance). A buy signal from this level can be a setup to trade for an increase in USD/JPY quotes.